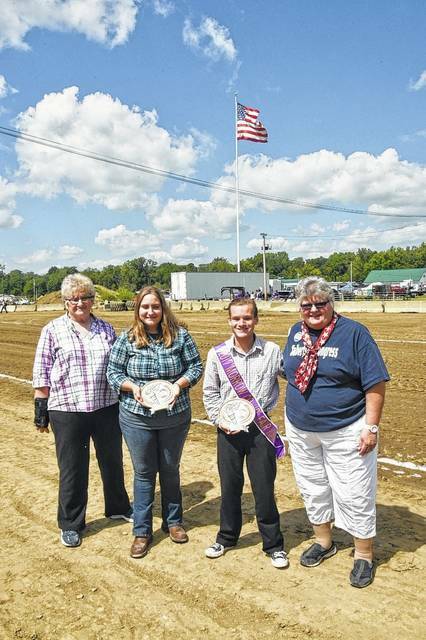 MOUNT GILEAD — Six Morrow County youths were honored Sunday during brief ceremonies at the Morrow County Fair. The presentations were made at the grandstand following the annual parade. Honored were Chaylse French and Manny Heilman, who received the Citizenship awards and Baley Shafer and Jacob Serio, recipients of the Leadershp Awards. Derek Goodman and Cassady Neviska were awarded the scholarship money. Chaylse, a graduate of Galion High School, is enrolled at Columbus State where she will study to be a Vet Tech. She represented 4-H IO where she is a news reporter and the group’s treasurer. Active with community service, she is also the club’s historian. Community service projects include visiting the dog shelter, selling beef sticks for projects and setting up projects for the club to complete. She also helped with the Community Day in Galion, doing yard work for the elderly. In recognition of this honor, they were presented beautifully designed plaques by the the Morrow County Democratic party represented by Susan Grundy and Kathy Adams. Leadership award recipient Bailey Shafer is a 2017 graduate of Cardington-Lincoln High School where she was active with the FFA Chapter, was a member of the National Honor Society and was a junior and senior class officer fulfilling leadership qualities of influence, responsibility and guidance. She is enrolled at Lourdes College, Toledo. Jacob Serio, first runner up to the 2017 Junior Fair king, is a senior at Highland High School where he was president of his class for two years. He is treasurer of the Junior Fair board, head of the rabbit barn department and president of the Youth in Government program, demonstrating his leadership abilities. These monetary awards were made by the Morrow County Republicans and presented by Patricia Davies and Wes Goodman. 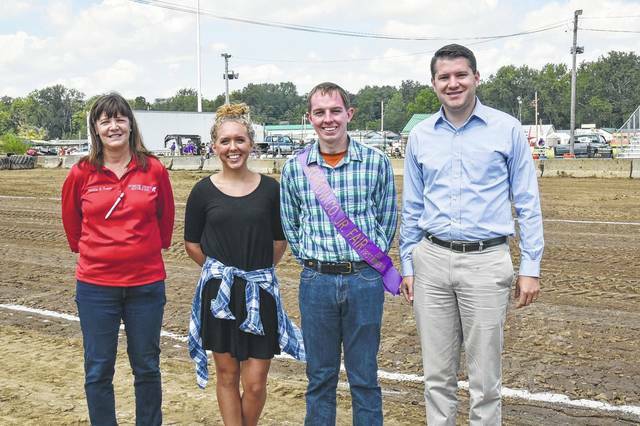 The Morrow County Fair Board’s $250 scholarships were awarded to Derek Goodman, a 2017 graduate of Cardington-Lincoln High School and a freshman on the main campus of The Ohio State University and to Cassady Neviska, a freshman at Mount Vernon Nazarene University. The awards were presented by Julie Logan, junior fair coordinator. Neviska was unable to be present. These awards were made following the parade during which Outstanding Fair Supporters Steve and Betty May were honored. Also recognized were the late Ralph and Mary Mosher, Outstanding Morrow County Fair Supporters, represented by family members. Rita Barton, Morrow County’s Outstanding Senior Citizen for 2017 was recognized as her float paused in front of the speaker’s platform. Each of the four county bands gave a performance at the grandstand and the directors were presented a monetary appreciation gift from the Morrow County Senior Fair Board and the Morrow County Republicans. Chaylse French and Manny Heilman, winners of the Citizenship Awards, are flanked by Kathy Adams, left and Susan Grundy, right who presented the awards on behalf of the Morrow County Democratic Party. https://www.morrowcountysentinel.com/wp-content/uploads/sites/29/2017/09/web1_Citizenship-awards-2017.jpgChaylse French and Manny Heilman, winners of the Citizenship Awards, are flanked by Kathy Adams, left and Susan Grundy, right who presented the awards on behalf of the Morrow County Democratic Party. Winners of the 2017 Morrow County Junior Fair Leadership Awards Bailey Shafer and Jacob Serio are flanked by Patricia Davies and State Rep. Wes Goodman, who presented the awards on behalf of the Morrow County Republicans. https://www.morrowcountysentinel.com/wp-content/uploads/sites/29/2017/09/web1_Leadership-Awards-2017.jpgWinners of the 2017 Morrow County Junior Fair Leadership Awards Bailey Shafer and Jacob Serio are flanked by Patricia Davies and State Rep. Wes Goodman, who presented the awards on behalf of the Morrow County Republicans. Julie Logan, Morrow County Junior Fair coordinator, presents the Morrow County Fair Board scholarship to Derek Goodman. The second scholarship recipient, Cassady Neviska, was not present. 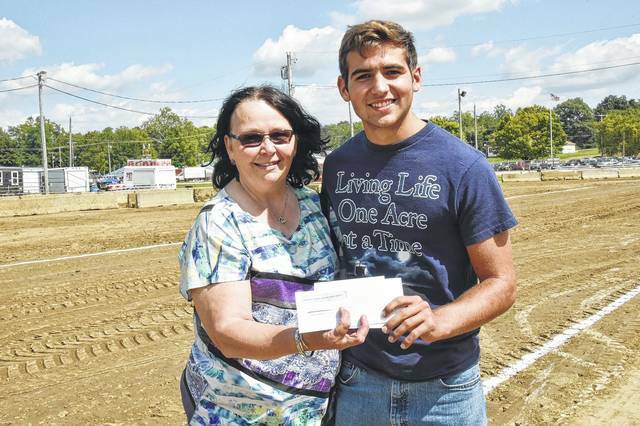 https://www.morrowcountysentinel.com/wp-content/uploads/sites/29/2017/09/web1_Julie-Logan-and-Derek-Goodman.jpgJulie Logan, Morrow County Junior Fair coordinator, presents the Morrow County Fair Board scholarship to Derek Goodman. The second scholarship recipient, Cassady Neviska, was not present.